The Staddon Heights Golf Club has a magnificent cliff-top setting, enjoying commanding views over the historic Plymouth Sound and the City itself. It was founded in 1904 as the United Services Golf Club, a title retained until 1969 when the then predominantly civilian membership purchased the course - mainly from the Ministry of Defence. The Club celebrated its Centenary in 2004, and in that year completed work on 2 new holes, the current 16th and 17th. During the same construction period the Club found itself having to make changes to the routing of the course to avoid playing across Staddon Lane, is it had for many years. New 11th and 12th greens were also built and the 5th and 6th holes combined into a new Par 5, bringing the course to its current incarnation. The new holes have increased the quality of the views available from around the course. Now, not only is there the spectacular panorama of the Sound and the City, but also away to the North and West to Dartmoor. The Club was originally formed and financed by the various officers' messes in the Plymouth area to provide golfing facilities for their members. Civilians, although admitted, were very much in the minority and were permitted no involvement in the management of the Club. Until 1969 the President of the Club was always the Commander-in Chief, subsequently Flag Officer, Plymouth, and the Captaincy of the Club was, until 1957, always in the hands of the Naval Chief-of-Staff or other golf-playing senior serviceman. The first 9-hole layout was on land subsequently occupied by RAF Mount Batten, and extended to the cliff top land at nearby Jennycliff. Services use of Mount Batten expanded, and with every-increasing public leisure use of the Jennycliff area the course moved away from its original location. In 1946 the full course was located on Staddon Heights itself. Civilian membership numbers gradually increased to exceed those of the Services, and finally, when the club purchased the course in 1969, its direct links with H.M.Services were abolished together with the preferential membership and fee levels previously enjoyed by serving forces personnel. The course itself straddles the boundary between the Plymouth City and South Hams District Councils with the larger part of the course in South Hams. 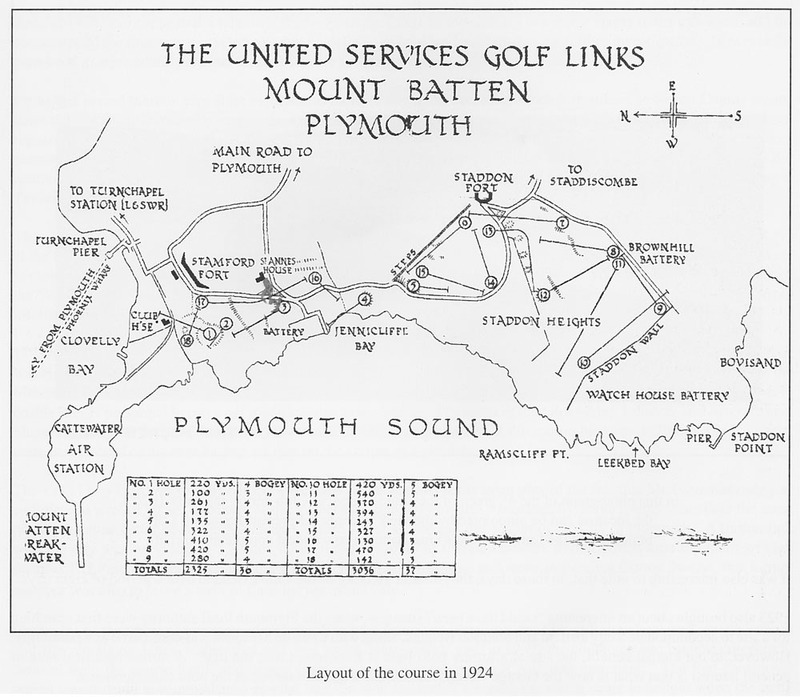 Nonetheless, the club very much looks upon itself as "Plymouth's Golf Club", with holes within the City boundary and the majority of its membership is drawn from the City and its suburbs. Three clubhouses have served on the present site, the current one opened in 1985, and there have been many changes and improvements in both the Clubhouse and the course. These continue, the Clubhouse expanded with the addition of the Centenary Room in 2004, itself expanded in 2009 to provide the same spectacular views that can be seen from the Club Lounge, Horizons Restaurant and Bar. Staddon personalities have made their mark on the County and Regional Amateur stage. Dave Roberts has twice been Devon County Captain, in 1998-99 and again in 2006-7. Club historian Alf palmer was President of Devon County Golf Union for 2007-8, and in 2010 will become President os the South West Counties Golf Association. For the Ladies' Barbara Perriton is the 2010/11 Devon County Ladies' Captain.